SERVED: Almost a year ago, Tyson from Survivor: Tocantins was almost SERVING of the Week, but narrowly missed out thanks to someone else's legal woes. The year has come full circle because this week Tyson got completely blindsided and now ranks as the 3rd dumbest Survivor ever (behind Micronesia/Fans vs. Faves Erik and China's James). When both tribes were forced to go to Tribal Council this week and Boston Rob won individual immunity, the dominant alliance saw this as the perfect time to take out champion flirt, Parvati. The original plan was for everyone to vote Parvati, but tell Russell he was next out to get him to flush out the Hidden Immunity Idol. Boston Rob came to a realization that if Russell were to give Parvati his Idol then Russell, Parvati, and Danielle's 3 votes would determine who went home, so Rob came up with another plan. It was decided that 3 would vote Parvati, 3 Russell, and then Russell, Parvati, and Danielle would vote their way (Tyson). This would force a 3-way tie, a re-vote, and then a way to get rid of Russell. Russell decided to step up his gameplay too so pulled Tyson aside and said he'd vote out Parvati and this was a relief to Tyson who really wanted Parvati out. 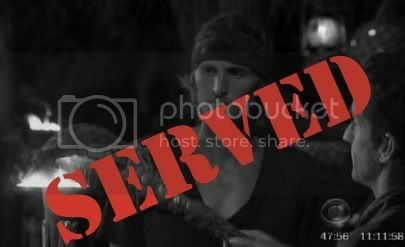 No one expected Russell to give his Immunity Idol to Parvati, and when she had the Idol, all votes against her were null. But only 3 votes so the alliance could still make the re-vote happen... wrong! Tyson, at the last minute, switched his vote to Parvati making the now 4 votes for Parvati null. That meant there were only 2 votes for Russell and 3 for Tyson. SERVED! Tyson basically voted himself out of the game. What a moron! Tyson had been a favorite of mine since Tocantins but this was one of the dumbest moves EVER! The dumbass got outwitted bigtime: Tyson, got SERVED baaaaad! I still can't believe thaþ. These guys just don't get Russell. ITA Tyson is 3rd behind James & Eric. Having said all that I'm glad Parvati is still in the game. Boston Rob the con, Parvati the flirt, Russell the loose cannon. Bring on the Merge! Too bad Steff, Tom & Cirie are out. Surprised how little I care for Amanda, JT, James & Candace this time. The anorexic girl is the sleeper. Nobody is paying any attention to her.